Every October (and even in late September), I get so excited about Halloween, and intend to play a bunch of spooky games to celebrate. And that… doesn’t usually pan out. Was 2016 any different? Read on to find out! FNAF: Sister Location (PC) – If you don’t count the RPG spinoff, this is the first FNAF game I’ve really gotten into. And it’s spectacular. While it is not quite as terrifying as its older brothers, Sister Location is still Spooky As Heck. Year Walk (WiiU) – I’ve been itching to replay this for months, telling myself “wait for Halloween” and finally the time came! It’s a really great adventure with clever puzzles and a neat twist halfway through. Turns out that you can clear it in well under an hour, but still, it’s Pretty Darn Spooky. 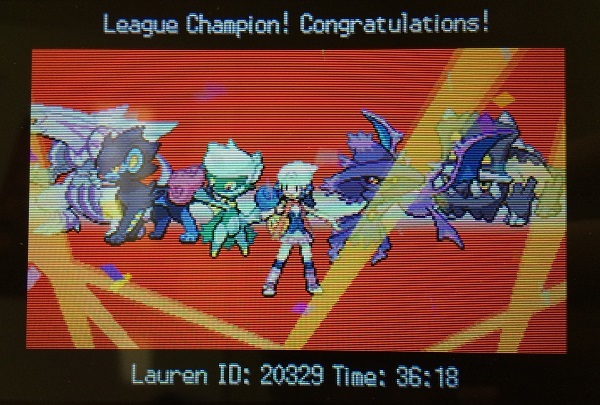 Pokémon Pearl (DS) – While I have a team that’s half spooky-looking Pokémon (Misdreavus, Crobat, and Luxray), and the bad guys want to basically destroy the universe, Pokémon is simply Not Spooky. Metroid Prime: Federation Force (3DS) – A regular Metroid game could definitely be considered spooky, but with Federation Force’s focus on action and teamwork, it falls just short of the bar. Not Spooky, but a very solid game otherwise. Picross 3D Round 2 (3DS) – Decidedly Not Spooky. In fact, it may be the least spooky game on the list, with its relaxing atmosphere and lack of any sort of conflict. Final Fantasy VIII (PC) – There are a number of creepy monsters and witches in this game, but overall, I’d have to say that it’s Not Spooky. The hammy characters and colourful graphics just don’t lend themselves well to creating a frightful atmosphere. Haunted Hotel (WiiU) – One game included in the questionable First Skunk Bundle. It can only pass as Spoopy at best, and will be better known for being annoying and baffling (and terrible!). I wrote more words about this one if you’re curious. 3D Streets of Rage 2 (3DS) – A Genesis “classic” that I’d never played before, but is consistently praised by those who grew up with it. As a game about walking to the right and punching innumerable thugs, it’s Not Spooky. 3D Streets of Rage 2 (3DS) – Beating the game once unlocked Fists of Death mode, in which all enemies die from a single hit. Even more Not Spooky than round one, now that there’s no threat. Paper Mario: Color Splash (WiiU) – While it does include the token Haunted Hotel level, this game is Not Spooky on the whole. But what it lacks in spookiness, it makes up for in charm and beauty. Also, maybe the best soundtrack in a Mario game ever? The Cat Lady (PC) – A click-em-up adventure that I thought would be a little more scary and a little less horrific. It turned out to be a little more about exacting vengeance on serial killers than I’d expected, but it does have some Notably Spooky moments. Dragon Quest VII (3DS) – Come on, now. Even the monsters in DQ games are adorable. While some of the scenarios are cruel and heart-rending, this is definitely Not Spooky. Beautiful Katamari (PS3) – There’s no way. This one is absolutely Not Spooky. I think there’s a jack-o-lantern that you can roll up, but that’s about the worst of it. Dementium Remastered (3DS) – Remember how originally, Doom 3 sucked because you had to constantly switch between flashlight and gun? Renegade Kid made a game based entirely around that idea. It is Kinda Spooky, though. Monster Hunter Generations (3DS) – Took a long break to play through Federation Force, but now, Huntering Times are back. And despite having the word “monster” in the title, it’s really Not Spooky.